The Problem: Around the globe, sea turtles and their hatchlings fall victim to natural predators. Crabs, raccoons, armadillos, boars, birds and coyotes all play their role in the natural food chain as sea turtle predators. However, the threats of predation increase when human development reaches nesting beaches. People who leave trash near the shore, for example, unwittingly call raccoons and other non-native species to the beaches to look for food. Raccoons destroy tens of thousands of sea turtle eggs and hatchlings each year and are one of the greatest causes of sea turtle mortality on Florida's beaches. In the U.S., 40 to 80 percent of loggerhead and green turtle nests are destroyed by predators. In Central America, many communities permit their domesticated dogs and cats to run free in coastal villages. These domesticated dogs, when left unattended, can dig up several sea turtle nests in one night. With as few as one in 10,000 hatchlings reaching adulthood, the destruction of only a few nests can have a devastating effect on a sea turtle population. Dogs eat the eggs and hatchlings and can even attack adult females while they nest. While sea turtles have developed special adaptations that allow them to be agile in water, they remain clumsy on land. They are not fast enough, or agile enough to escape these predators. Unable to retract their heads and flippers into their shell, like land tortoises, sea turtles are very vulnerable to these invasive predators. 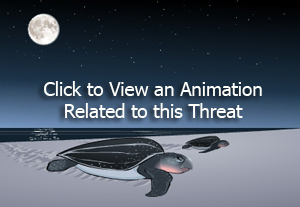 Species Affected: All sea turtle species are affected by predation, especially on eggs and hatchlings. * Contact your local law enforcement if you witness any predation on sea turtle nests or hatchlings. Case Study: Currently, Hobe Sound National Wildlife Refuge, located in Martin County, Florida, has ongoing efforts to reduce raccoon, skunk, rat and dog predation of eggs and hatchlings. Hobe Sound provides important, protected nesting habitat for three threatened and endangered sea turtles: loggerhead, leatherback, and green. Before the USDA's Wildlife Services began to work on predation in 1997, more than 95% of all hatchlings were lost to dogs and other species. As a result of predator monitoring and removal, there has been a sharp decline in nest predation. This work has ensured the survival of thousands of sea turtle hatchling. In 2002, it was estimated that 120,597 sea turtle eggs were saved as a result of predation controls.